Do you love running and hiking, but your stroller is not working on bumpy grass, forest paths and other rough terrain? Well, it seems like you need a good off-road jogger. And BOB Sport Utility Stroller is one of the best! This jogging stroller is designed for advanced runners and off-road adventure lovers. It works on dirt, unbeaten roads, wooded trails, snow and even mud! It will definitely meet expectations of every parent who loves running on the most challenging terrains. However, BOB Sport Utility Stroller is not multi-functional. It won’t work as an everyday pushchair. Why? Read mu full review and find out! BOB Sport Utility is currently unavailable on the market. 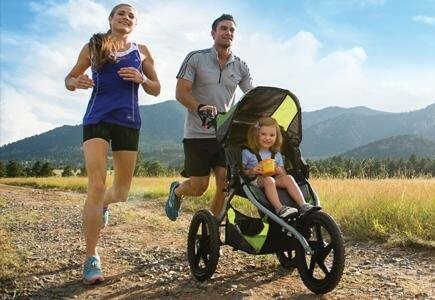 If you’d like to start jogging with your baby, check my list of the best running strollers for 2019 and choose the right model for you. Which BOB model should I choose? This is typical sport stroller, designed for running and other outdoor workouts. Few great features make it excellent for harsh, uneven terrain, but not perfect for running daily errands or shopping. Large wheels with wide tires, great amortization and famous BOB adjustable suspension system will protect your little passenger from shocks and provide you with smooth ride on uneven terrain, rocks, roots, sandy beaches and grassy paths. 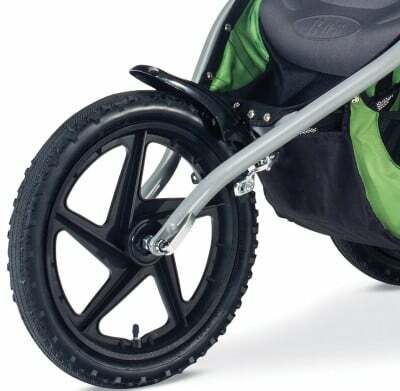 The fixed front wheel provides excellent stability even on tough and bumpy surfaces and allows parents to push the stroller effortlessly during jogging. 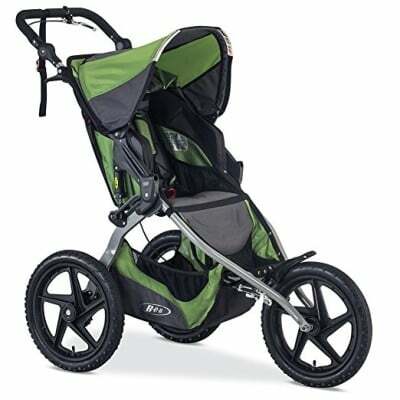 BOB Sport Utility Stroller is designed for off-the-road running and jogging on bumpy trails. This stroller is not good for shopping, because it is quite big and doesn’t feature swivel front wheel. If you are looking for a multi-purpose stroller which you could take for a jogging and to the store, you should consider other BOB models with pivoting front wheel which makes stroller easier navigate and turn in tight places (for example BOB Revolution PRO or BOB Revolution SE). 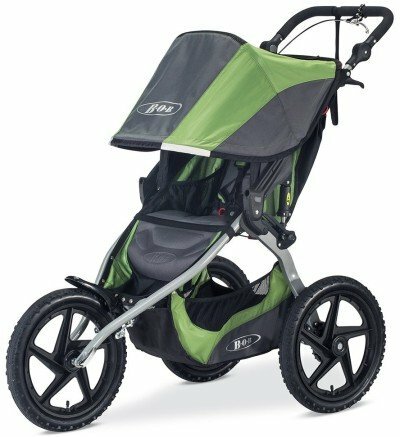 Nevertheless, BOB Sport Utility is an excellent stroller for active parents and advanced runners. It’s designed for jogging and it serves its purpose really well. Let’s take a closer look at its features. This BOB jogging stroller is equipped with amazing suspension system that can be adjusted for baby’s weight. Looser suspension is great for heavier child and stiffer one is for lighter baby. This suspension guarantees incredibly smooth ride. There are 16” wheels – two in the back and one in the front, with knobby mountain pumped tires which will get you over rough terrain and absorb shocks. The tires are not only large but also air-filled and thanks to it the stroller handles bumps, uneven terrain and different types of surface very well. The traction and shock-absorption is great even on wooded trails and mud. 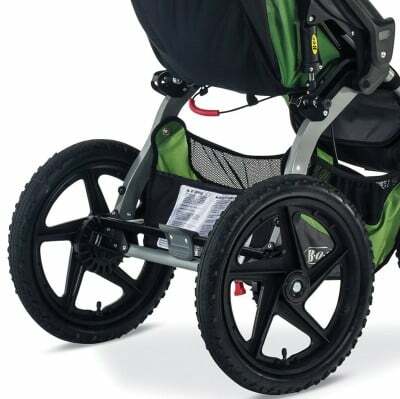 The front wheel is fixed which gives you more stability while you are jogging or hiking, even when the trail is rough. 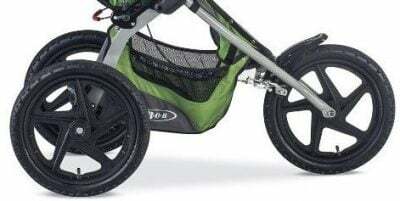 It has also a fender to protect the passenger and stroller from getting dirty when you’re strolling over mud and unbeaten trails. However, the front wheels doesn’t swivel which makes the stroller rather not suitable for running errands or shopping at the mall. As in other BOB joggers this one also has a foot-operated parking brake, located between the rear wheels. Be careful while wearing flip-flops – it can be a bit more difficult to set and release the brake. One of the main advantages of BOB Sport Utility 2016 is an additional brake, which is hand-operated. It is very useful during jogging downhill and allows you to easily control the speed. Without a handbrake it would be really difficult to control the stroller especially on hilly or bumpy terrain and at high speed. BOB Sport Utility Stroller 2016 has very cushioned seat with soft padding on the back and the bottom. The stroller is also equipped with a detachable padding for your baby’s lower back. This single BOB stroller can accommodate a passenger up to 75 lbs. You can recline the seat down to 70° from vertical, by using a buckle on the back of the seat. It’s deep enough to provide comfortable place for a baby who like to nap on the go. Remember to use the full recline only when walking, not jogging. The is also 5-point harness, necessary for baby safety. The harness is nicely padded and has release buckle in the middle which is fairly easy to use for the parent. Remember that you can use this stroller for running when your baby can hold up his/her head and sit upright unassisted (around 6-8 month). If you want to use it for your newborn (for walks) you need to purchase an infant car seat compatible with it and a proper adapter, because the main seat doesn’t recline flat. You can also find a head rest for the baby, until he/she develop full head and neck control. This stroller has also a good support for legs and feet. All BOB jogging strollers have really great large canopies. BOB Sport Utility sunshade can be adjusted to multiple positions and has a big peek-a-boo window which allows you to check on your baby during the stroll. This canopy goes pretty far down to provide a good amount of shade for your little one. However some parents complain it doesn’t lock properly when it’s fully open. 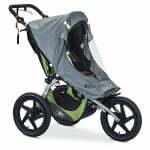 Jogging stroller BOB Sport Utility has a handlebar with foam cover and it can be set in one of nine positions. It goes from 35” to 48.5” from the ground, which makes this stroller suitable for all-heights parents. My husband is a foot taller than me (6’2”) so he uses different position of the handlebar than I do. Thanks to adjustable handlebar pushing is comfortable for both of us. In older versions of this stroller the handlebar was unadjustable, I’m really glad the manufacturer has upgraded this feature. 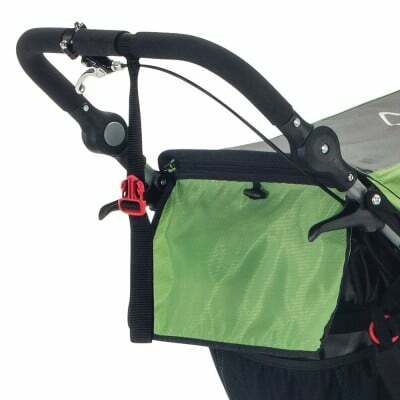 The wrist strap is attached to the handlebar and it gives you extra protection so the stroller won’t run away from you. 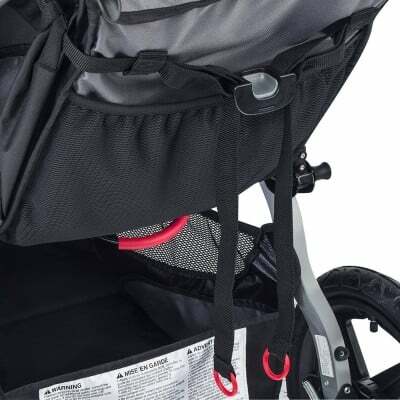 You should be careful with this strap during jogging, because if you fall it may pull the stroller down with you. BOB 2016 Sport Utility has plenty space for your essentials and your baby gear. You can keep your large diaper bag in the spacious basket underneath the seat. For your essentials like keys, cell phone, wallet or wipes, there is a backseat pocket. And your baby can keep the sippy cup or favorite toy in the interior seat pockets. This jogging stroller doesn’t include parent console or tray but you will have to buy it, because you will need a safe and convenient place for your bottle of water. You can fold BOB Sport Utility Stroller in two steps, using both hands. The whole process is fairly easy, but I wish it was one-handed. Like in other BOB jogging strollers, there is no automatic lock. After you fold the stroller, you need to bend down and use a clip which is attached to the wrist strap and manually lock the stroller to keep it in closed position. It’s not great solution for parents with back problems or moms who recently had a C-section. Even when folded, this stroller is quite big (39.5” x 26” x 24.5”) and it takes significant amount of space in trunk. You can remove the rear wheels to make it more compact and easier to store at home or transport in car trunk. BOB Sport Utility Stroller is quite large and heavy – it weighs 28.6 lbs. For some parents it may be difficult to lift to the car trunk, but as a petite woman I can assure you it is doable. However, I would not recommend traveling with it. This isn’t a stroller for shopping either. It is DESIGNED for heavy-duty, outdoor use and it serves this purpose excellent! Remember that all joggers are large, quite heavy and bulky, especially those high-quality ones. If you want a frame made of good materials, large canopy and big wheels for uneven terrain, you need to be prepared it will be a bit heavy and take up some space. 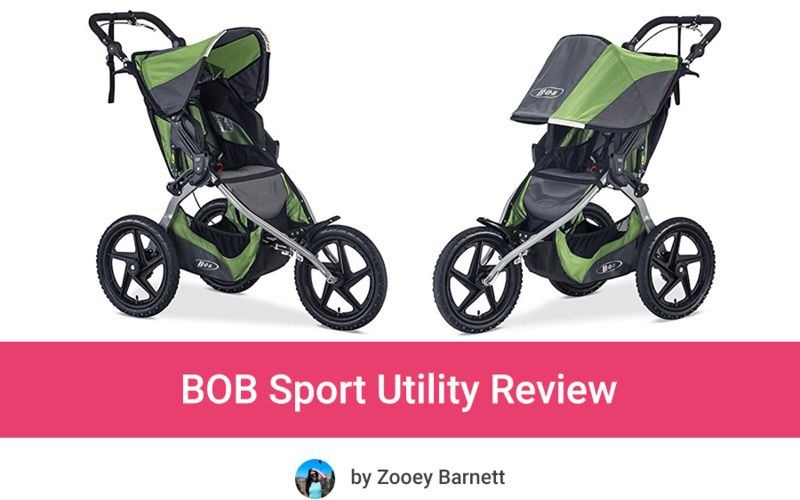 BOB Sport Utility doesn’t have many reviews online, but here are the main features that parents mention most often. It can handle snow without getting stuck and the traction is great even on mud. Shock absorbers provide smooth ride even on bumpy terrain. Thanks to the front wheel fender little passenger is protected from getting dirty even when you’re running over mud or slush. As for a running stroller BOB Sport Utility feels very light and easy to push. The handbrake is very useful when going downhill. Another advantage is the handlebar which adjusts for very short and very tall parents and there is more room behind the stroller so tall person doesn’t kick the back of it when pushing. The canopy gives great coverage from the sun. Some parents complain about the canopy being flimsy – it doesn’t lock when fully open so on windy days it blows back and folds. Moreover, the stroller doesn’t maneuver in narrow spaces (like in store aisles) well – but parents use it mostly for outdoor workouts, not shopping or running errands. Another drawback is short back rest – it’s enough only for about 3 years. The pocket on the back seat is not very convenient for bottle of water so parents have to spend extra money on a handlebar console. 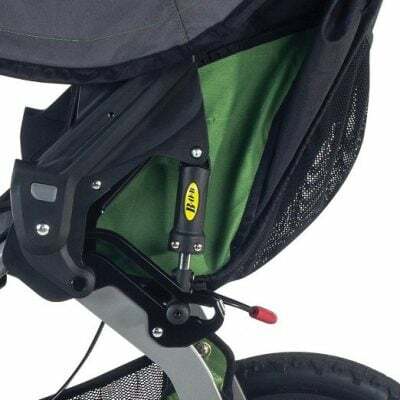 There are many great accessories that work with all BOB jogging strollers (like the child tray or parent console), but there are also some items that are compatible only with BOB strollers that have fixed front wheel (the weather shields). BOB 2016 Single Infant Car Seat Adapter (for example for BOB & Britax) – BOB Sport Utility is compatible with BOB & Britax infant car seat and few other brands as well. If you want to use this jogging stroller as a travel system, make sure to buy a car seat that works with it and a proper adapter. BOB Single Snack Tray – It’s useful to have a convenient place for baby’s snacks and sippy cup or bottle of water. In my opinion child tray is a must-have, especially if you love long-distance running and strolling. Bob Stroller Handlebar Console with Tire Pump – This adult console is equipped with two cup holders which is very useful, since it difficult (and unsafe) to reach out for a bottle of water to the backseat pocket during jogging. Thanks to this console you can also keep your phone and keys at hand. 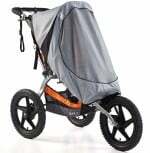 BOB Sun Shield for Sport Utility Stroller – Great accessory for keeping the child protected from sun rays, wind and insects. 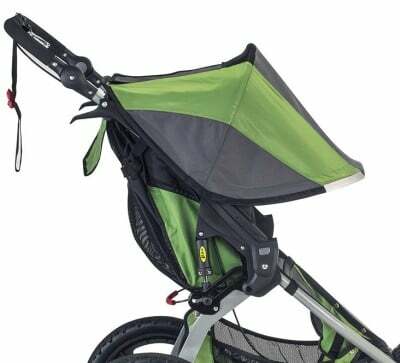 BOB Weather Shield for Sport Utility Stroller – I always keep a rain cover in the storage basket, just in case. It’s a must-have if you live in area where it rains a lot. BOB Sport Utility has limited five-year warranty on the frame and limited one-year warranty on other components and fabric. To get the original product & warranty, buy this stroller from an official seller, approved by BOB. I know that all the BOB jogging strollers look very similar and it can be difficult to decide what model you should choose. Remember that BOB joggers have different size of the wheels, some of them don’t have handbrake, not every model has swivel and lockable front wheel or adjustable handlebar. But other than that, they have similar feature like huge canopy, great adjustable suspension system, reclining padded seat and plenty of storage. Oh, there is one more difference – the price – of course! 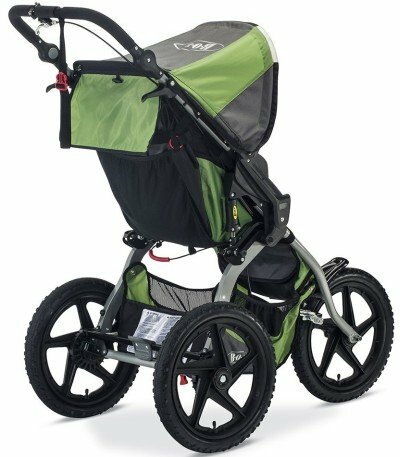 🙂 You will find some BOB jogging strollers under $400 (like BOB Rambler) and others for about $500 (like BOB Revolution PRO). The price depends on features, accessories and specification. If you are looking for a stroller that is suitable for running and taking to the mall as well you should choose BOB with swivel lockable front wheel. If you’d prefer stroller only for jogging or training to marathon go for BOB with fixed front wheel. Do you like strolling and running in hilly area? Then the handbrake is a must-have. If you’re very short or very tall person choose BOB with adjustable handlebar. BOB Sport Utility Stroller is designed to handle the toughest terrain and provide your baby with smooth and safety ride. This stroller is stable, chunky and perfectly suited for non-paved roads. This is a fixed-wheel style stroller which means it handles rough, bumpy terrain perfectly, however it’s less maneuverable in tight, narrow spaces. Fixed front wheel is designed for running, not for shopping and daily errands in the city center. Many parents recommend this stroller for running, rather than strolling around the city. If you want a stroller with swivel front wheel, check out other BOB joggers. 1. If you want your child to join you during your outdoor workouts and you are looking for a stable and safe stroller for off-road jogging, this one will definitely meet your expectations. 2. It’s perfect choice for parents who live in rural area with lots of unbeaten roads or in area where it’s snowing a lot during winter. 3. 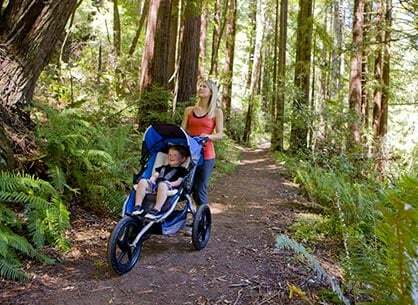 This is a great stroller for parents who like running in woods and/or train to marathon. Do you like this stroller? Before you decide to buy it, check out the availability. And if this stroller is not what you need, you may find better match in my ranking of the best strollers for 2019.